When I was little, my mom worked as a floral designer. I grew up cutting Queen Anne's Lace with her on the side of the road, de-thorning roses, taking trips to the wholesaler, and watching her create huge beautiful arrangements for weddings. She taught me so much and recently we had a blast collaborating to create a flower arranging how-to for Your Williamson Magazine. 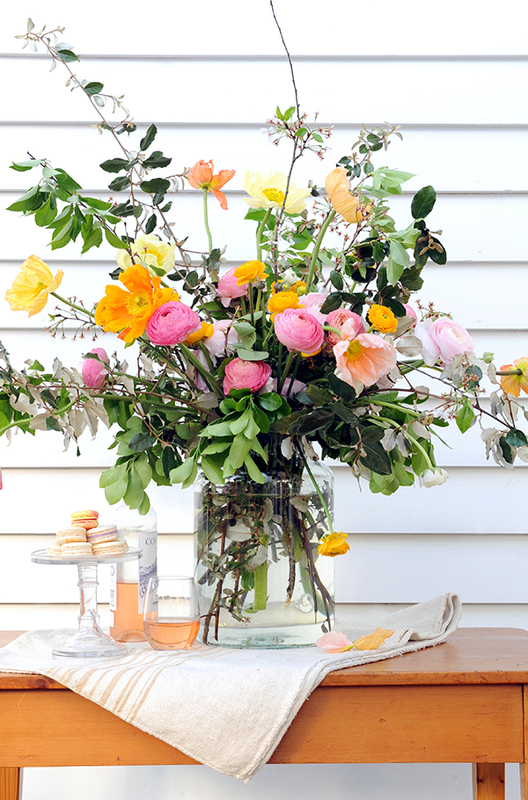 Custom flower arrangements can be expensive, but with a little know-how and practice, creating a beautiful floral centerpiece using fresh flowers from the garden or brought home from the market can be a simple, and fun, DIY spring project. You can always throw grocery store flowers in any old vase, but if you know just a few tricks, it's easy to create much more professional and original displays. The best overall advice? 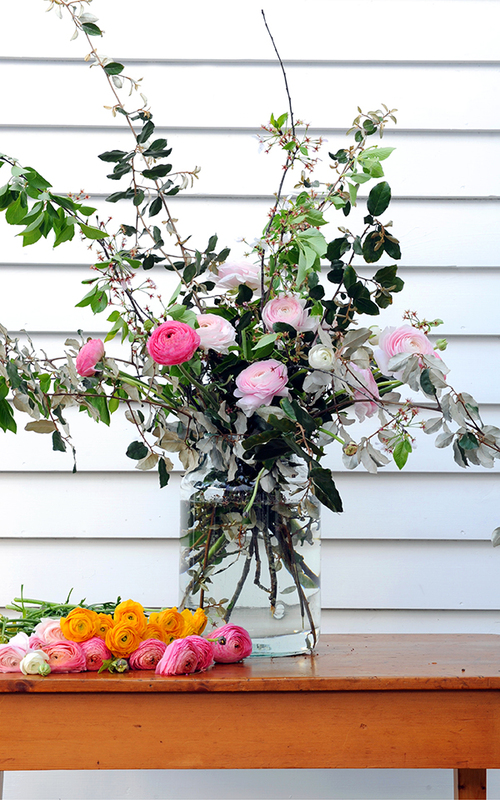 Don't wait for a special occasion to treat yourself to fresh flowers at home. They make any day a little brighter. Start by preparing the flowers so they'll last their longest. If cutting garden flowers, do so in the cool of early morning or after sunset. 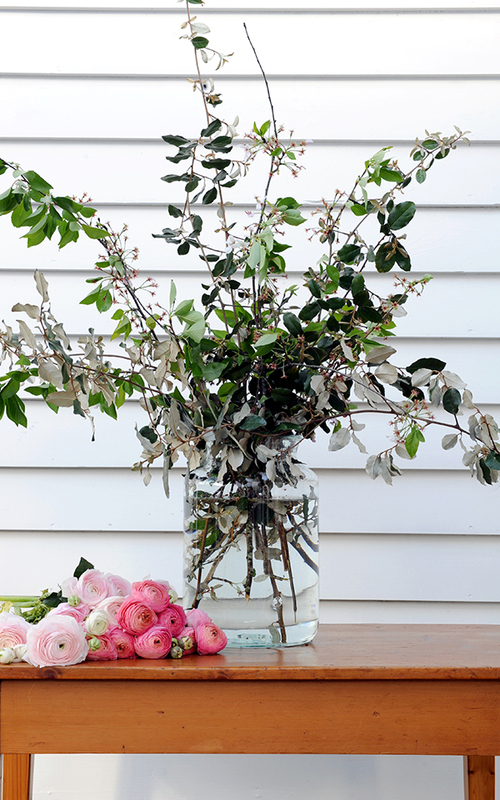 Immerse stems in cool water, and let the flowers drink for about an hour before arranging them. Whether you buy flowers or snip your own, cut stems on an angle before arranging, and remove any foliage that would fall below the waterline. Every two days or so, change the water, add a sprinkling of flower food, and recut the stems if they've browned. Select a container that will show off your selected flowers the best. Look beyond the standard vase; consider bowls, pitchers, and even vintage glassware for smaller arrangements. Fill the vase with fresh, room temperature water, and add a commercial cut-flower food or a teaspoon of liquid bleach to the water to prevent the growth of bacteria. Use tape to construct a checkerboard pattern on the mouth of the vase creating a framework to hold flowers where you want them. Create a foundation with foliage (we used Elaeagnus and cherry blossoms cut from the yard). This is the framework for the arrangement. Build a pleasing, asymmetrical shape that leans on the lip of the vase and has a high point in back. Make sure it’s not too thick, so there’s room for the flowers. Add large “face” flowers (like ranunculus in warm sherbet tones), cutting stems at different lengths so some blooms nestle low and others extend. Take your time, experimenting until you like the placement of each flower.